The NFL Responds to the Sandy Hook Massacre. Should We Listen? The NFL cannot be a force for nonviolence because its popularity is the perfect reflection of what we’ve become as a country. After the massacre at Sandy Hook Elementary School in Newtown, Connecticut, the NFL and its players made an effort on Sunday to recognize the collective grief shaking the country. There was a moment of silence at all fourteen NFL games in remembrance of the twenty-six people, including twenty children, mercilessly gunned down. Players on the New York Giants wore decals with the school’s initials on their helmets. Their star wide receiver Victor Cruz paid tribute to one of the fallen children, writing “R.I.P. 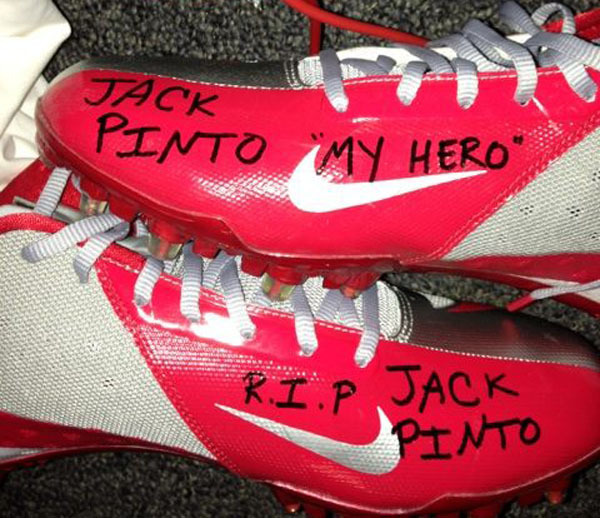 Jack Pinto,” and “Jack Pinto, my hero” on his shoes and “This one is 4 u!” on the backs of his gloves. Cruz was Pinto’s favorite player and 6-year-old Jack will be buried in his Victor Cruz jersey. The New England Patriots also made a statement, wearing a helmet sticker with the Newtown city seal and a black ribbon. They in addition pledged to donate $25,000 to help each family affected by the tragedy. But it’s what the Patriots didn’t do that speaks volumes and perhaps says more than they intended. Normally after the team scores at home, their “end zone militia”, dressed as revolutionary war soldiers, shoots twenty muskets in the air. There were no guns fired, thankfully, on Sunday night. The NFL’s intervention into this national tragedy as a voice against gun violence comes at an awkward time for the league. Just two weeks ago, Kansas City Chief’s player Jovan Belcher shot and killed the mother of his 2-month-old child, Kasandra Perkins before taking his own life. Belcher had an arsenal of weapons in his house, all of them—like the guns used in Newtown—legally purchased. When NBC broadcaster Bob Costas, the day after the Belcher murder/suicide, said that easy access to military-proficient guns combined with our glorified “gun culture” played a central role in this tragedy, he was derided by the Fox News crowd as a fool. Now he looks horribly prescient. But, as we try to understand the numbing regularity of these mass shootings, there is also a question that goes beyond just gun control and mental health. Should our culture, and in particular the violence of the sports we consume, shoulder some of the blame? It’s an increasingly recognized fact that our most popular sport, football, is also our most violent. Every new study reveals that on Sundays we are watching people become mentally and physically crippled for our entertainment. In addition to the violence between the lines, this is a league that drapes itself in the trappings of war, from military flyovers before games to the constant slickly produced recruitment ads for the US armed forces. Given all of this, can the NFL as an institution be a credible voice of peace? The answer is simply “no”: not even when they silence their muskets. The NFL cannot be a force for nonviolence because its popularity is the perfect reflection of what we’ve become as a country. We are a nation that has outsourced war overseas to remote control killer drones we overwhelmingly support, private security forces we don’t control and an armed forces we barely acknowledge. Meanwhile, a host of basic freedoms have been eroded over the last decade except the freedom to arm ourselves to the teeth. We can’t assemble with our neighbors in protest, but we can assemble military-style weapons alone in our apartments. As we become further atomized and further desensitized to the daily violence that surrounds us, we also further worship a sports league that acts as the perfect metaphor for this state of affairs. We don’t have to see the glassy eyes or faces contorted with pain on the field, as they are safely hidden under helmets for our consumption. We also don’t have to see the broken bodies and lives off the field. We just get three and a half hours of incredibly entertaining, highly commodified violence in a safely consumable package. The true costs are hidden from us until they erupt into view, as in the case of Jovan Belcher or the suicide of the great Junior Seau. Similarly, the true costs of worshiping the way of the gun are only dragged into open view when it comes home to places like Newtown, Connecticut. We don’t have to see the faces or learn the names of the children killed in the drone strikes in Pakistan. We aren’t asked to care about the young black teenagers who die on the corners of Chicago. No NFL player writes their names on their shoes. But now we have to look in the mirror and either reckon with what we see or recoil and turn away. If we want to follow the example of the NFL, the answer doesn’t lie on the field. Follow the example of the seven NFL players who turned in their guns to team officials the week after the Belcher shootings out of fear of what might happen if they were in the wrong state of mind or if a family member somehow grabbed ahold of their weapons. But even that is not enough. We need to throw ourselves on the machines of violence in Washington, DC, otherwise we are just dooming ourselves to more of the same. And the same is simply intolerable. Read Sasha Abramsky’s call for sensible gun policy.